The banking industry is losing billions of dollars every year to fraud. We've lost the breathing room we had when checks took two or more days to collect. 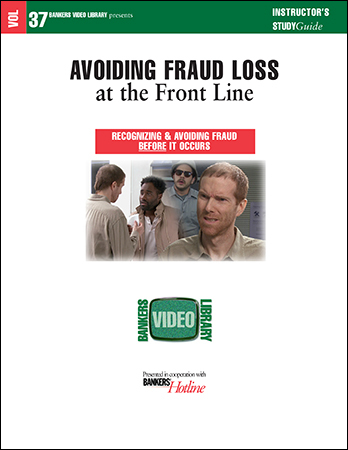 Now it is imperative for the front line to recognize fraud when it is being perpetrated and stop it immediately. Though we take the time to caution and take measures to combat identity theft, the fact remains that check fraud is the single major cause of our losses, followed by internal theft. The illustrations in this training program help the training officer to drive home lessons on how to recognize and reduce fraud.